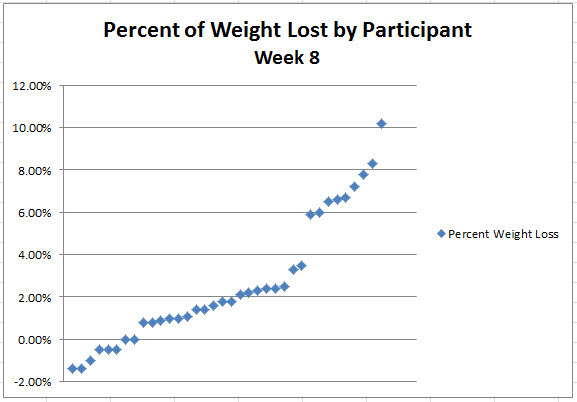 We're eight weeks into our Biggest Loser program and the 36 participants have lost 2.64% of their starting weight -- 170 pounds. Weight loss by individuals has varied dramatically as you can see in this chart. We've been announcing an individual and team winner each week. At the individual level, it has been nice to see six different names announced over the eight weeks. One of our teams, Team MoGo (Moms on the Go), has taken the lead from a team perspective. They're down 4.72% of their starting weight (49 pounds.) Most of the members of this team have been active in the past and they're working hard to take off weight gained after having children. I often see them exercising together. We have held two team challenges, which I still intend to write about, and have a third one schedule for this Thursday. We have also held two educational sessions -- one on small changes you can make to cut calories and a second on motivation and willpower. Team leaders are doing a portion control exercise with their teams. Hopefully, I'll have some pictures of that to share next week.